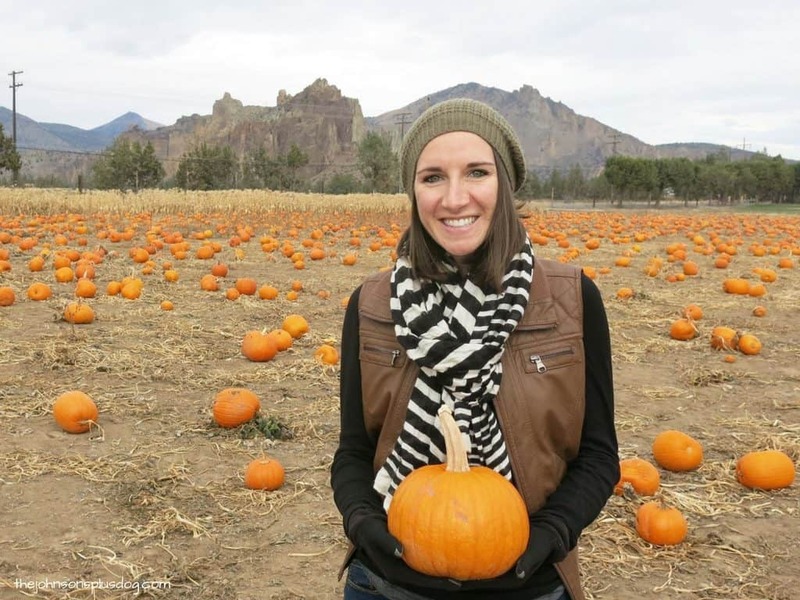 If you’re looking for a cute way to announce your pregnancy to your close friends and family during the fall season, you’re going to love this Halloween pregnancy announcement. 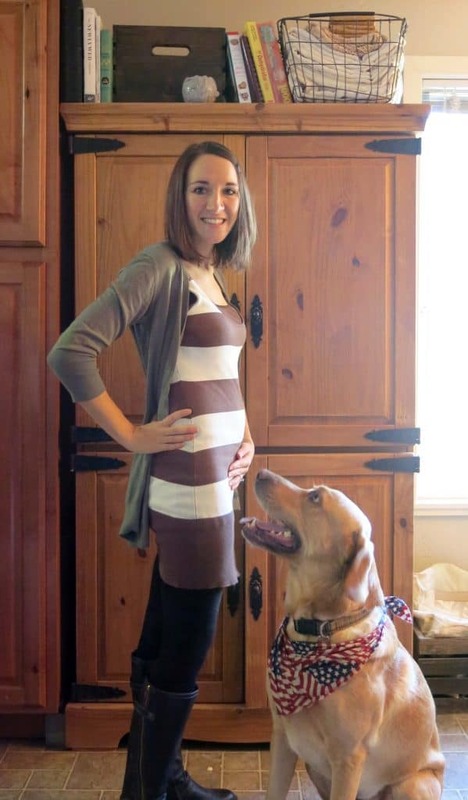 Your loved ones will never forget this creative Fall pregnancy announcement. First of all, let me just start out by saying I AM NOT PREGNANT AGAIN!!! 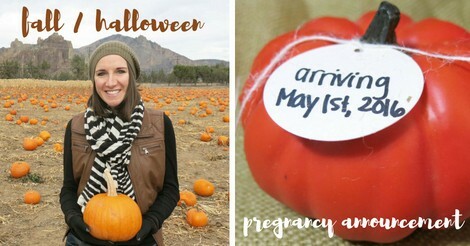 I could see how someone may see this Halloween pregnancy announcement and think, oh my goodness… she still has a baby! Believe you me, I’m not ready for another one quite yet. But today I wanted to share with you how we announced we were pregnant to our family last year right around this time of year with our fall pregnancy announcement. I couldn’t share with you guys then because we still weren’t telling the world wide web for another month or so after Halloween. This Halloween pregnancy announcement post contains affiliate links, but nothing that I wouldn’t wholeheartedly recommend anyway! Read my full disclosure here. I thought about it tons and scrolled through Pinterest looking at every single Halloween pregnancy announcement out there. 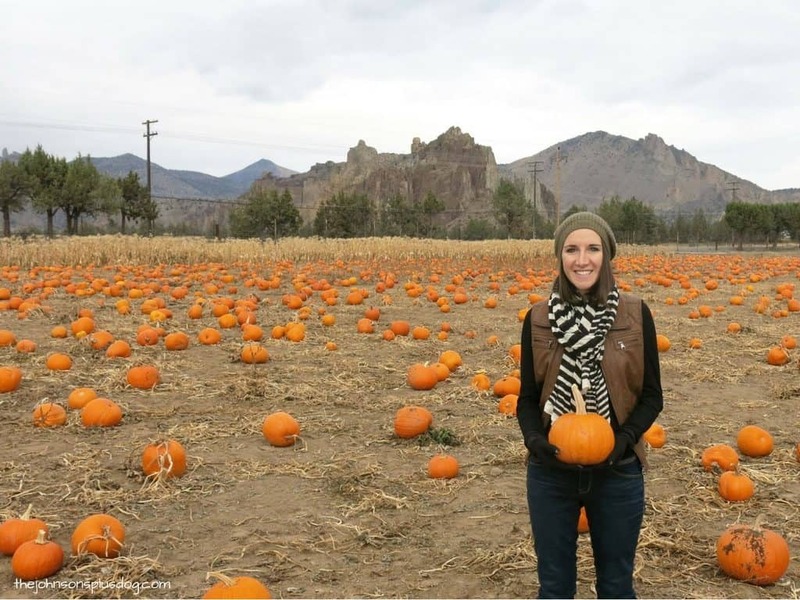 I finally settled with photos at the pumpkin patch and a cute little box with a mini pumpkin inside announcing our due date. 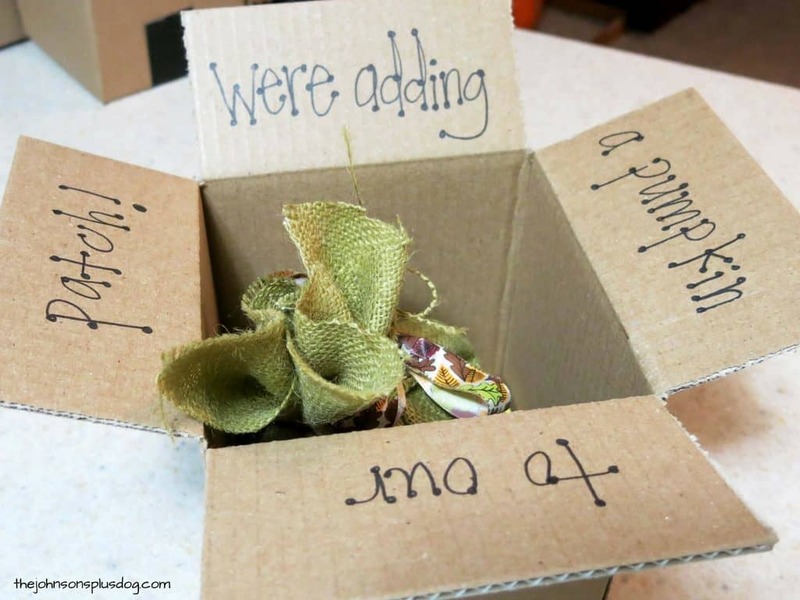 I made two different sized boxes. 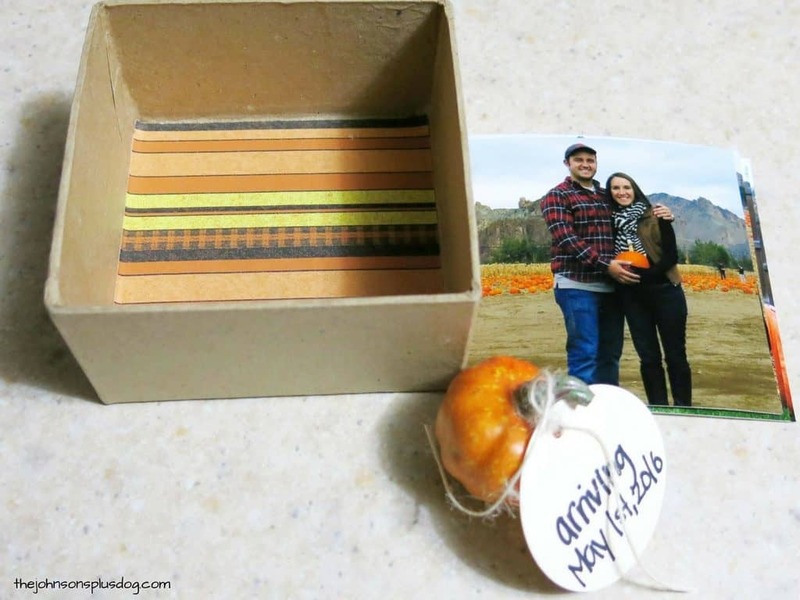 Both boxes has fun mini pumpkins announcing our due date. The larger boxes for our parents were complete with full size photos and pictures of our first ultrasound and filled to the brim with candy. The smaller boxes held some mini pictures and a couple of pieces of candy for everyone else. We had a bunch of boxes to make because we sent one to each set of parents, grandparents, aunts/uncles and some cousins (we had already told all of our siblings first, they win I guess, haha). 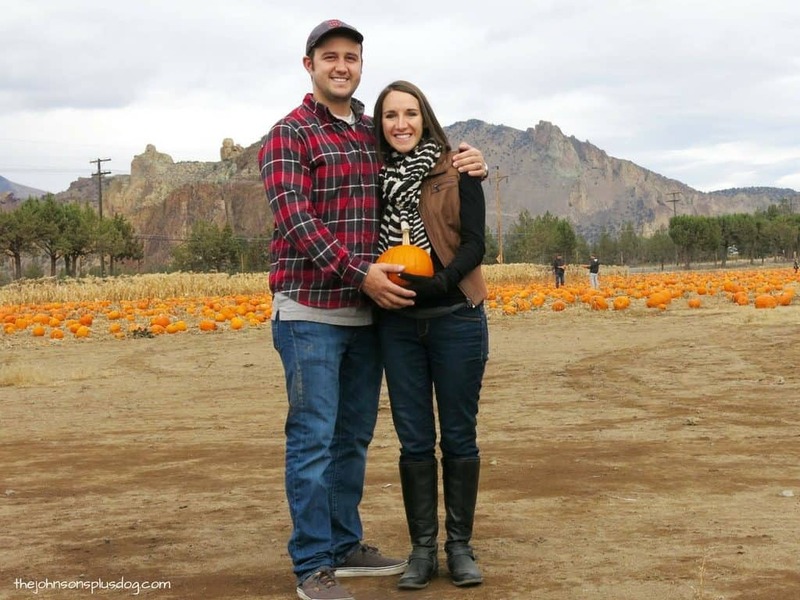 So we headed to the pumpkin patch and snapped a couple of pics for our Halloween pregnancy announcement. For the record, #mypumpkinpatchiscoolerthanyours. I mean, seriously?! I know it was a cloudy day, but will you just look at the amazing Smith Rock backdrop? Can’t beat it. For the fall pregnancy announcement large boxes, we used square boxes that were about 8” x 8”. On the inside of the top panels we wrote in “we’re adding a pumpkin to our patch”. Inside the boxes, we lined the bottom in fun Halloween themed paper, put in photos with fun notes on the back that talked all about my pregnancy so far. 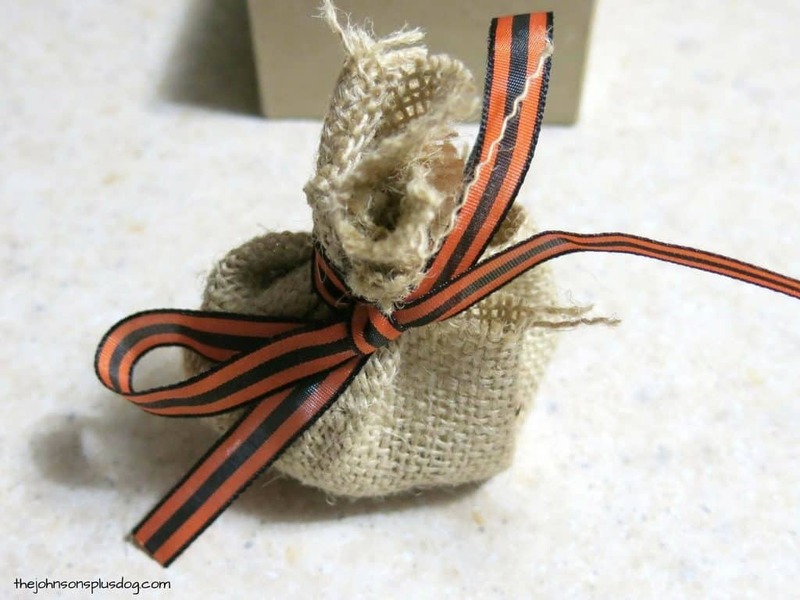 After we put the burlap wrapped pumpkin pouch in, we filled it to the brim with candy. 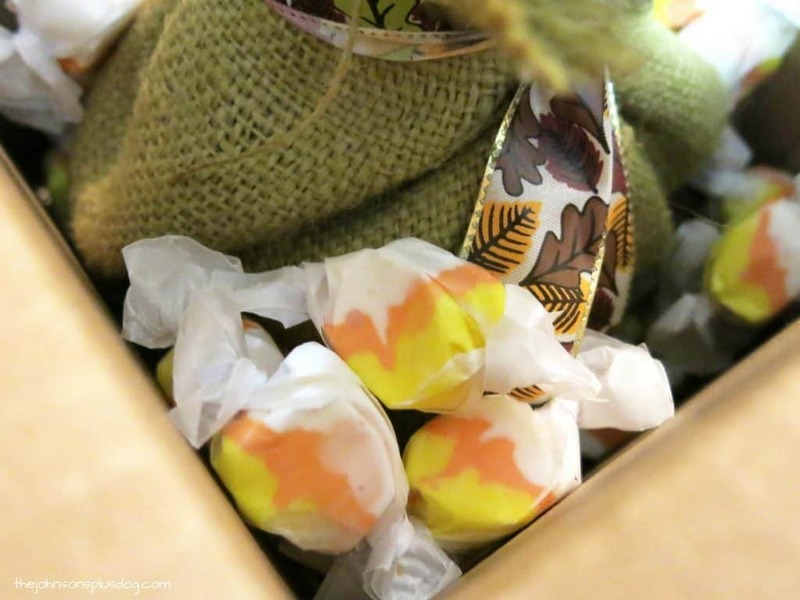 I chose Candy Corn Flavored Salt Water Taffy so it wouldn’t melt in the mail. 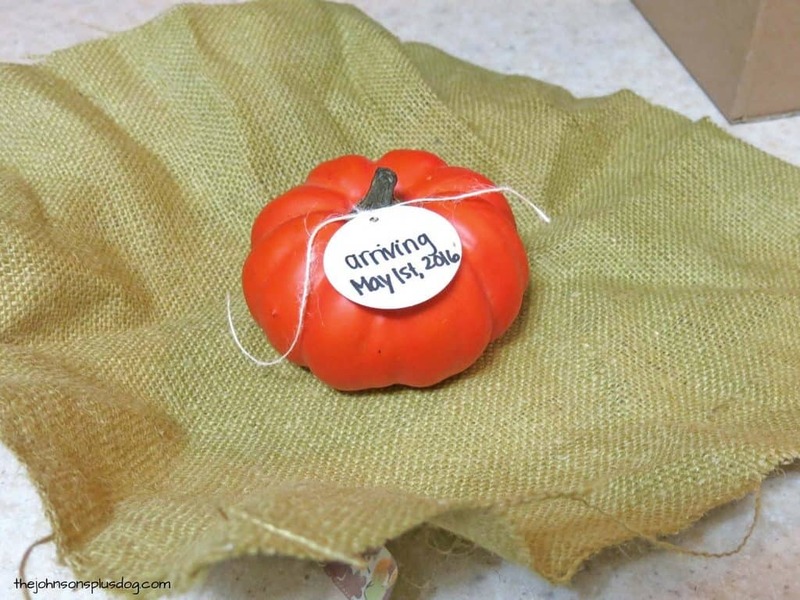 To create the smaller Halloween pregnancy announcements, we picked up some 3” square mini paper mache boxes. 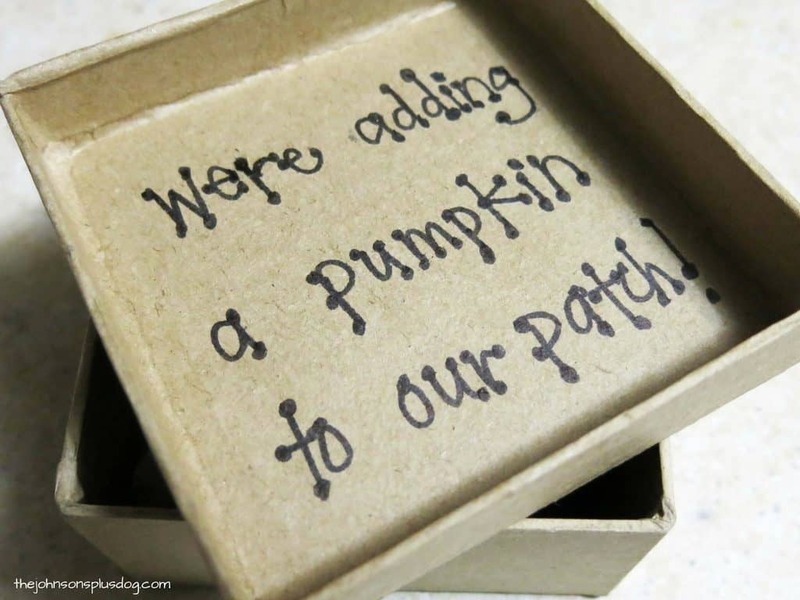 We wrote “we’re adding a pumpkin to our patch!” to the inside cover. Now, I don’t think you quite understand how itty-bitty, teeny-tiny this cute little mini pumpkin is. The pictures don’t do justice. I should have grabbed a photo of it in my hand. Here’s a link to the Amazon product and you can see better how tiny it is. It is seriously like an inch and a half wide. Gah, so cute. 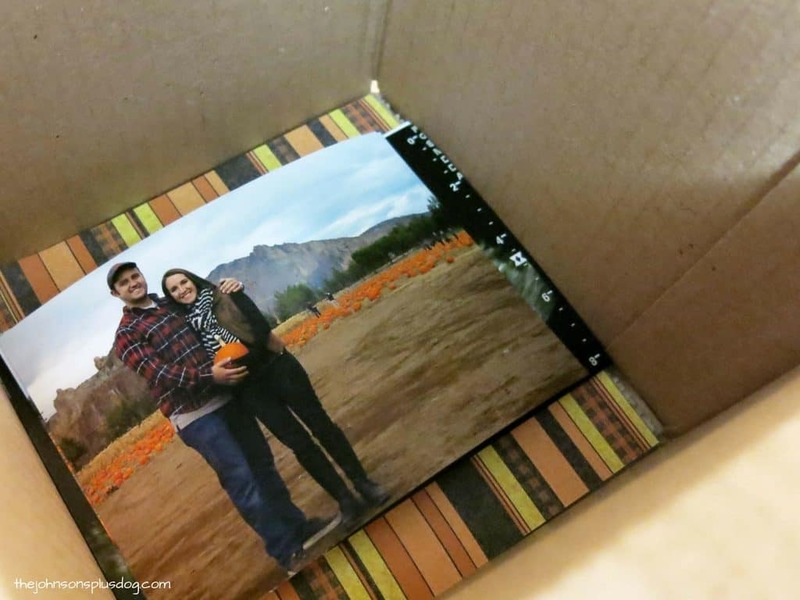 Just like the larger pictures, we lined the bottom with patterned paper, put in the photos and burlap wrapped pumpkin. It was so fun getting the calls from our family as they received our Halloween pregnancy announcement in the mail. I think my favorite was my cousin, Jade (which if any of you that know her, you’ll totally be able to see this in your head). My Grandma knew that I was sending something in the mail to Jade for her birthday so she saw the package and dropped it off my cousin’s house assuming it was for her. Jade proceeded to open it as my Grandma was driving down to her house (she lives next door). Jade couldn’t contain her excitement, she doesn’t really contain anything very well. She came running down the driveway after my Grandma’s car flailing her arms and screaming “Chelsea’s pregnant! 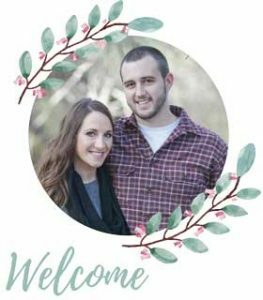 Chelsea’s pregnant!” When my Grandma finally got out of her car and figured out what was going on, they instantly called and left me the sweetest voicemail with so much excitement in their voices. Now I’m going to say this one more time for anyone that is still somehow confused… I AM NOT PREGNANT AGAIN! 🙂 Hehe. 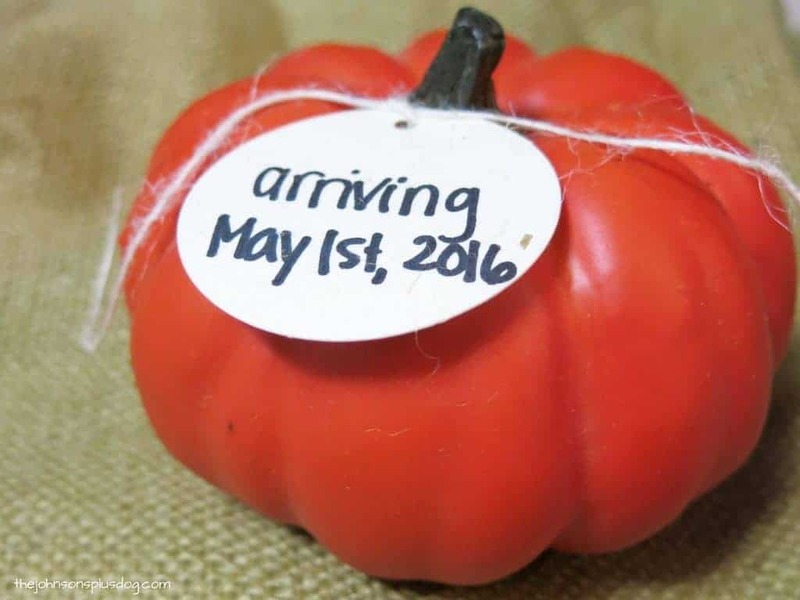 Are you looking for a fun Halloween pregnancy announcement? 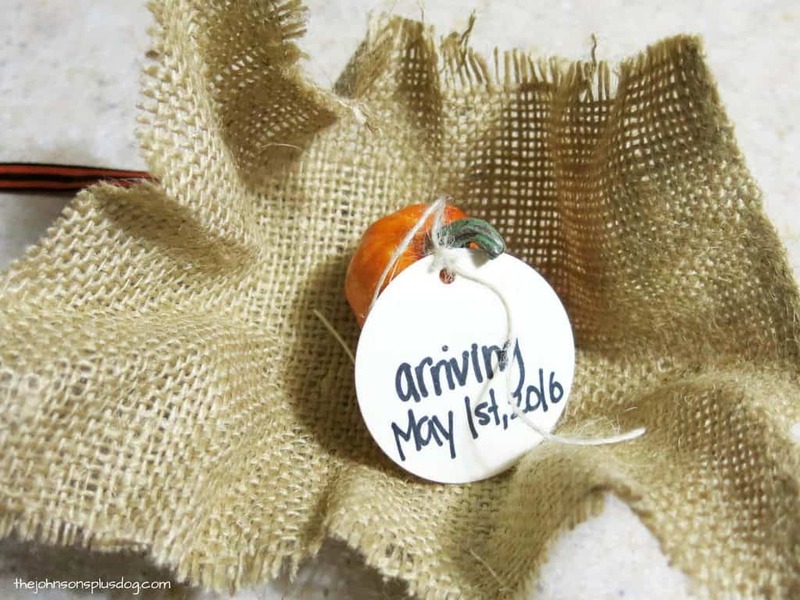 Maybe you are just a few weeks pregnant and itching to tell your friends and family that you’ve got a pumpkin on the way? Send them some happy mail to spread the news! 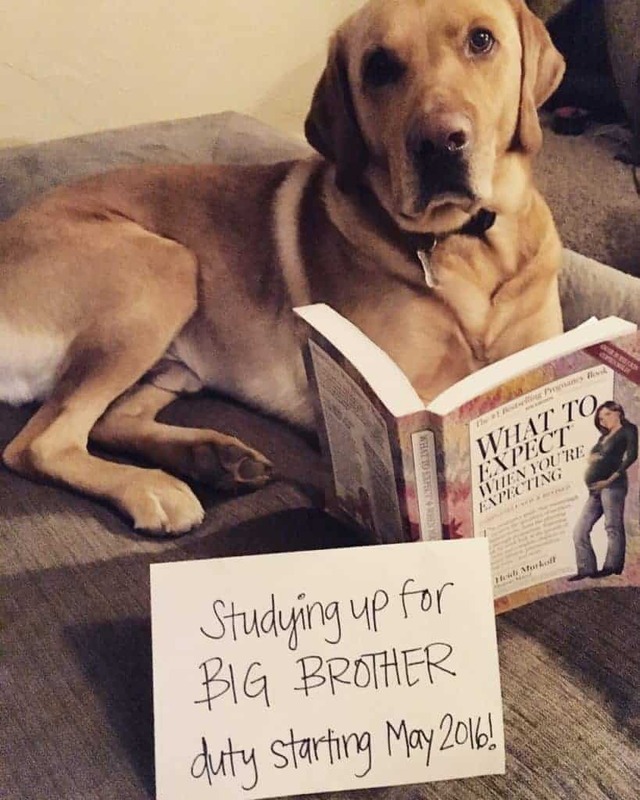 How did you announce your pregnancy?? Chels!! 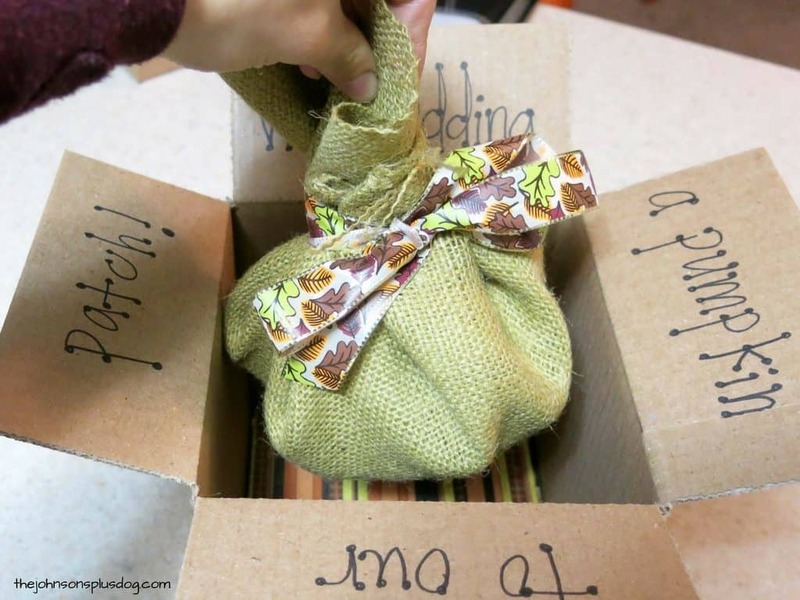 OMG that pumpkin box is the freaking cutest thing I’ve ever seen!! Also lol.. yeah, thought you were preg again for a split second…hehe. XO Love ya! Thanks CP! Haha… that would just be completely crazy!